On Saturday, October 3, a Russian fighter flown from Syria entered Turkish airspace without Turkey’s permission. Image by UK Royal Air Force, wikimedia commons. Turkey responded by summoning the Russian Ambassador to Turkey to receive a formal complaint from the Turkish government. The US, the UK, and NATO officials reiterated that they will stand by Turkey against any aggression. Naturally, Russia will pretend that the incursion was accidental. Given the equipment used by Russian fighters, it is unlikely that the incursion was accidental or unknown to the Russian pilot. 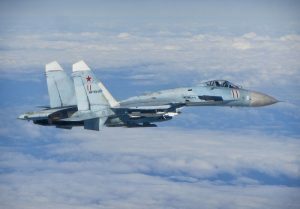 Given the command and control procedures enforced by the Russian Air Force, it is highly unlikely that the Russian pilot acted without the prior approval of bosses in Moscow. So why would Russia look to annoy Turkey? It wouldn’t. The incursion was not meant to insult or annoy the Turkish government. It was almost certainly an intelligence operation. Other Russian aircraft and ships in the area likely were listening to the Turkish reaction. The Russian GRU (military intelligence) will carefully analyze data collected, such as radar and radio signals from Turkey, along with a timeline of the mission. Apparently, the Kremlin felt that the information gained would be worth the minor diplomatic fallout. Let’s see if Moscow risks the same trick with Israel. I doubt it will. Israel, given its small area, cannot afford to be so patient with aircraft incursions.